Happy New Year to all our customers new and old! Here is to a great year in 2019 and lets hope for another good saltwater year. 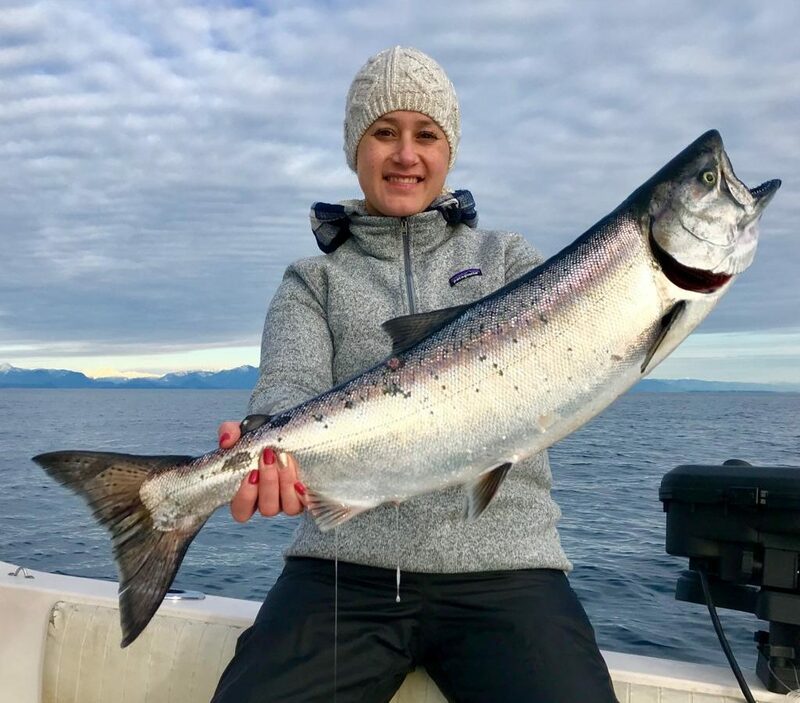 The New Year winter chinook fishing has been off to a solid start with good reports in all the major fishing areas such as Howe Sound, Gulf Islands, and right close to home in Vancouver Harbour. Some friends from Puget Sound also sent me some great shots of rather larger winter chinook as their season just opened up on Jan 1. Prawning has also been good, but crabbing continues to be slow as the traps have been full of undersize, so best to leave the crab traps at home right now and focus on prawns. It’s going to be wet and windy this weekend, but not even the 90 mm forecast stopped Eddie and guests on Thursday. If you want to catch fish in the winter make sure you dress warm and have good rain gear, it can make or break your day. Wear a next to skin layer for warmth and wicking away moisture, then a fleece layer to keep that heat in, then a good breathable and waterproof layer. A heater is a good idea as well, especially to warm the hands up after pulling the prawn gear. I love fixing downriggers in the pouring rain! If you wait for no wind and rain you might be waiting for awhile, as the long -term forecast is rain, wind, then some more rain, then some more wind. If it is too windy to venture further out, try Vancouver Harbour as it continues to produce. Parker with a nice chinook from Vancouver Harbour this past week! I was able to make it over to the Gulf Islands for New Years and there are some solid bait balls around and some nice size fish as well! Find the bait and find the fish! Natalie with an impressive winter chinook! As usual, keep your gear fairly close to the bottom, cover water in search of bait, and then once you find it, start to work that area with some more focus. Our top producers this week have been chartreuse glow flashers like the Salty Dawg, Phantom, and our custom series in UV Chartreuse or UV Green. Hot spoons have also been chartreuse and green with some glow, like Irish Cream, Yellow Tail, and Green Glow. The water has finally got a little cleaner so the darker shades of flashers and spoons are also working, such as UV Purple Phantom and UV Purple Pacific Angler Custom, paired up with Herring Aide spoons in Kingfisher or Skinny G. That clear water was from the cold snap we had, but that might change a bit this week as things have warmed up and the rivers will be flooding, adding silt and debris into the water column. As mentioned earlier prawning has been consistent and is a nice addition on a full day charter. Eddie’s guest with some prawns for dinner. If you want to give winter chinook fishing and prawning a try, give us a call on our charter phone at 778-788-8582. If you are looking for some solid advice and all the hottest flashers and spoons, drop by the shop. If you don’t live in the area and want some gear, give us a call and we would be happy to put an order together for you and mail it out.